The MC: Meg. Her voice was straightforward, no nonsense, and even she was fairly relatable. I felt her fears and suspicions were portrayed well, and that made her a believable character. The pacing: I got no fault to pick with it whatsoever. It was a fast read, with just the right amount of mush, just the right amount of suspense, just the right amount of description, just the right amount of almost everything. The whodunit: Damn. This was my favourite part of the book. I spent the entire read trying to figure it out, and this is mostly down to the grand job Ms McNeil did of making each and every one of them look like a suspect. I changed my mind so many darn times, I never know which way to turn and who not to face my back to. This is testament to the author’s story-weaving abilities. She keeps the reader on their toes, for sure—she certainly did me, anyway. The family debates this stirred: it’s not very often I force my reading addiction onto my family—especially my kids—but occasionally I come across a book that warrants their involvement. TEN was one of those books. Because I needed someone to bounce off the whodunit ideas. I needed someone to bounce back with their own ideas. My son made a great sounding board for this—to the point even he was guessing. Even after I’d finished the book. He must be more devious than me, though, as he called it, and I didn’t. The love interest: I liked TJs character a LOT. We meet him from the off, and are given the chance to like him from the off. He even continues to be there whenever and wherever Meg needs him the whole way throughout the entire novel. But even he isn’t free of suspicion—because when the suspicion is turned in his direction, it’s all too easy to accept it may be true. The ending: okay, let me just clarify—it wasn’t the actual ending-ending I didn’t like. It wasn’t the wrap up of the whodunit or any part of that within the book that bugged me. It was more the fact that there were two teens sat on an island surrounded by dead bodies, and they’re all swoony and smiling like the past terrifying hours didn’t happen to them. It was just too clean. And it kind of wiped away some of the believability the author had going on throughout the rest of the book. That said, did it mar my enjoyment of the book? Well, only by a smidgeon, so I’ve only knocked a half star off for it. Otherwise, I really truly got no complaints. Because this book took me less than a weekend to read and kept me intrigued and interested and hooked and, more importantly, entertained. In short: it did its job. So, if you love a good whodunit with amazing pacing, then you’ll most definitely enjoy Gretchen McNeil’s TEN. Gretchen is repped by Ginger Clark of Curtis Brown. Her YA horror/paranormal POSSESS debuts with Balzer + Bray for HarperCollins, August 23, 2011. 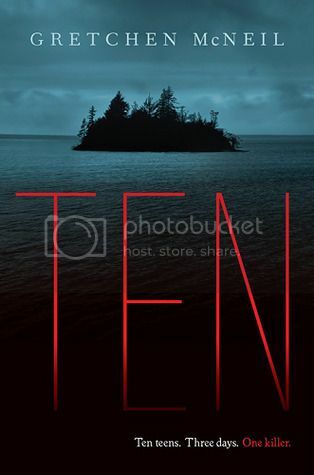 Her second novel, TEN – YA horror/suspense about ten teens trapped on a remote island with a serial killer – also with Balzer + Bray is tentatively scheduled for a Fall 2012release. The synopsis reminds me a bit of the tv miniseries Harper's Island, from 5 years ago, but your review had me adding this to my tbr on Goodreads. Another great review!